For those who are looking for a fence with more style and elegance than chain link, modular iron is the perfect choice. 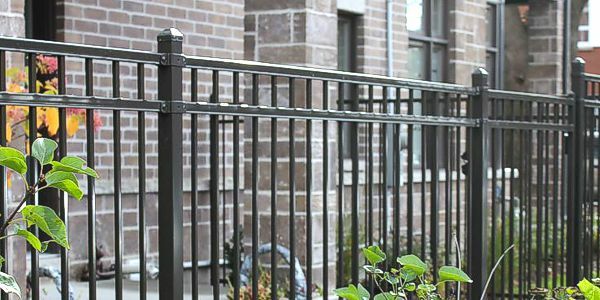 Modular Iron is manufactured to look like a traditional iron fence but without the maintenance. There are choice of finishes and colors available, the powder coating system comes with a 5 year warranty and the E-Coat finish comes with a 20 year warranty. As for the style of fence you can keep it simple or ornate with a choice of different spear tops, post caps and scroll work. Gates can also become a very focal point with arched rails and pickets. If your fence is being installed on a hill, we do offer a system which allows us to rack the panels to follow the grade with up to a 30” rise in a 8’ run without any gaps. This system is a great choice when you have a view you want to keep open, such as pool or the local landscape itself.